Good news! 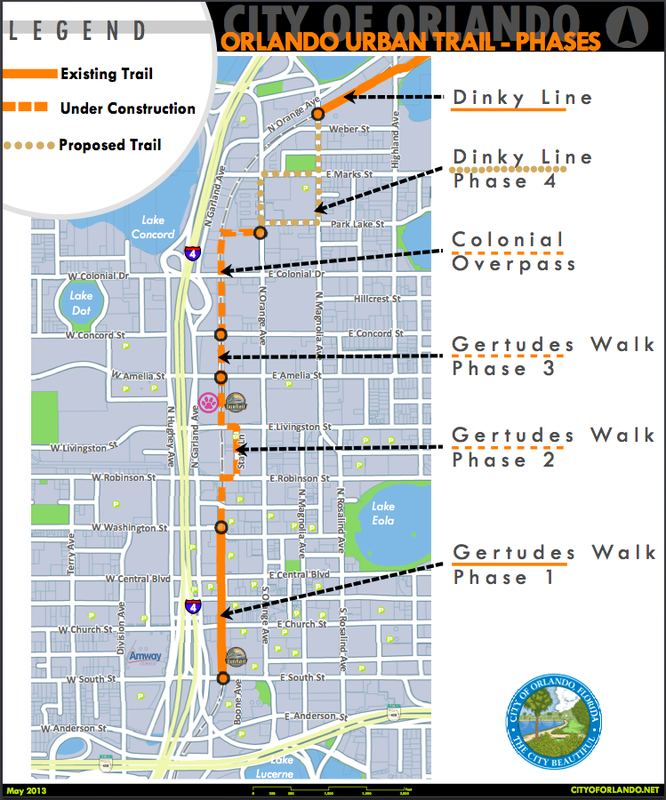 The Orlando City Council approved extensions to Gertrude’s Walk Urban Trail – a multi-use trail located in Downtown Orlando. The existing trail currently spans three blocks from Church Street to Washington Street running parallel to the railroad tracks. The new extensions add two additional links from Washington Street to Jefferson Street and from Amelia Street to Concord Street. Eventually, Gertrude’s Walk will link to the Orlando Urban Trail via the pedestrian bridge over Colonial Drive. The City’s Appearance Review Board approved the project proposal on Nov. 19. Click here to view their comments. Landscaping: The final landscaping details shall be brought back for an ARB Minor review and approval. Block One: between Washington Street on the south and Jefferson Street on the north. The trail will occupy the eastern 15 feet of the North Gertrude Avenue right of way, adjacent to the west side of the railroad corridor. North Gertrude Avenue will become a southbound one-way road. The trail will be 10′ wide adjacent to the roadway and will be separated from the rail corridor by landscaping and a fence/barrier at the right of way line. Block Two: between Amelia Street on the south and Concord Street on the north. The trail will occupy a 30′ wide easement adjacent to the west side of the railroad corridor. Click here for the first story regarding Gertrude’s Walk featured on the Bungalower.